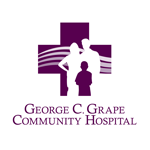 George C. Grape Community Hospital provides our logo for use by partners, vendors and associates. These items are the copyright protected property of George C. Grape Community Hospital. The Hospital reserves the right to request removal of it's logo or images from any material it deems inappropriate or questionable in manner. Additionally, The Hospital requires that all logos and images be maintained in their existing form, without alteration, unless prior permission is given.